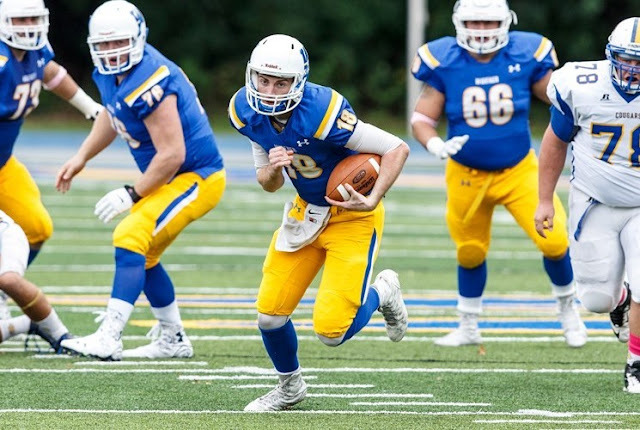 CHESTER, Pa. (Nov. 7, 2015) – Junior Alex Krivda (Sellersville, Pa.) passed for 406 yards and broke two school and conference records to lead the Widener University football team to a wild win over FDU-Florham by a 50-20 score on Saturday afternoon at Leslie C. Quick Stadium. The victory sent 24 seniors who were recognized for their contributions to the program out on a high note. Widener improved to 6-3 overall, including a 6-2 mark in Middle Atlantic Conference play, and into a three-way tie for second in the league standings with Stevenson and Delaware Valley. FDU-Florham dropped to 3-6 overall and 2-6 in MAC action with the loss. Krivda had a busy afternoon, racking up his 406 yards in the air by completing 44 of his 70 pass attempts. He broke single-game school and conference standards for passes completed and attempted, bettering Seth Klein’s 40 completions against Lebanon Valley in 2013 and Mike Lomas’ 67 throws versus Lycoming in 2003. After starting on their own 20 following a touchback off a punt from senior Ryan O’Hara (Royersford, Pa.), FDU-Florham marched 80 yards on eight plays to take an unprecedented 6-0 advantage. The drive was capped by an 8-yard touchdown pass from Tyler Maurer to Esaun Mobley with 5:04 remaining. The ensuing extra point attempt, however, was blocked by senior Shakore Phillip (Bay Shore, N.Y.) which would set the tone for what would be one of the wildest games in recent memory. Widener got back into the game by having its defense come through with big plays to create a short field for its offense, beginning on FDU-Florham’s next possession. With the Devils facing 3rd-and-13 from their own 17, Maurer fumbled the ball on a sack and Tyree Nobles came up with it to put the Pride on the 3-yard line. Senior Robert Getz (Kunkletown, Pa.) bulldozed his way into the endzone on the next play, and O’Hara converted the ensuing kick to make it 7-6 in favor of the hosts with 1:20 on the clock. The Pride outscored the Devils 23-6 in the second quarter to break loose. Krivda completed seven passes, including three for double-digit yardage, on the team’s first drive of the second quarter and threw a 9-yarder to junior Max Kutler (Cranbury, N.J.) to make it 14-6. FDU-Florham answered with a touchdown on its next opportunity, but Widener still found a way to put points on the board despite giving up the score on a 23-yard touchdown pass. Senior Stacey Sunnerville (Freehold, N.J.), who is used to pressuring the opposing team’s quarterback, became the second Widener player to block an extra point attempt in the contest. The loose ball was then scooped up and returning to the opposite end zone by senior Ka’shawn Garnes (Poughkeepsie, N.Y.), putting the Pride ahead by a 16-12 score. Widener then tacked on another touchdown when Krivda connected with Price for 20 yards and a third in the quarter when Price caught a 25-yard pass from Krivda. The second touchdown from Krivda to Price ended a 99-yard drive after Garnes intercepted a pass on the 1-yard line and robbed the Devils of a potential touchdown. The teams headed to the locker rooms with the Pride ahead by a 30-7 score. In the second half, Widener continued its run of scoring 36 unanswered points before the Devils closed out the scoring with a touchdown and two-point conversion. Getz leaped over a pile of Devils and into the end zone on the Pride’s first offensive possession, senior Philip Ragona (Oceanside, N.Y.) caught a 13-yard touchdown pass from Krivda and O’Hara booted two field goals to make it 50-12 with under 11 minutes remaining in regulation. FDU-Florham, which had an interception returned for a touchdown called back for a defensive penalty in the second half, closed out the scoring when Maurer completed a 19-yard pass to Malik Pressley before finding Mobley in the end zone for a two-point conversion with 4:38 left. In addition to Krivda’s record-breaking performance, Widener was also led offensively by Price and Ragona. Price caught nine passes for 109 yards, including two touchdowns, and Ragona made 11 catches for 99 yards and reached paydirt once. Senior Brandon Jones (Baltimore, Md.) paced the defense with four tackles, including two for sacks and three for a loss. Jamal Goodman had nine tackles. FDU-Florham’s Maurer lit up for 399 yards in the air by completing 41 of his 63 attempts and three for touchdowns. Pressley had a game-high 164 yards receiving and two touchdowns, while Nathan Scales paced the defense with eight tackles. Widener wraps up the regular season when it visits archrival Delaware Valley on Saturday, Nov. 14 at 1:00 p.m.